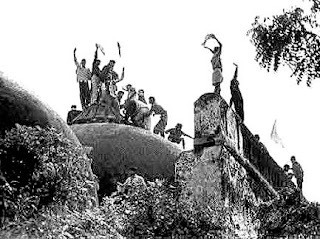 New Delhi: Sixteen years on from the Sangh parivar’s single biggest act of infamy, the Bharatiya Janata Party and its leaders are likely to discover there is no political statute of limitations for the crimes of conspiracy, incitement, rioting and vandalism that were committed in the name of Hindutva when the Babri Masjid was demolished on December 6, 1992. Having prospered politically for more than a decade from the resulting polarisation, the BJP’s ‘rath’ eventually ran out of steam in 2004. The catalyst was perhaps the Gujarat killings of 2002 or the neoliberal economic policies to which the illiberal politics of Hindutva were wedded. But today, after its second consecutive defeat in a general election, the BJP finds itself increasingly aware of the liability that communalism has become. Officially, the party claims the demolition was the result of spontaneous action by the mob which it had mobilised in Ayodhya that fateful day. BJP leader L.K. Advani, whose alleged role in the conspiracy is the subject of a CBI prosecution, famously described the event as the “saddest day” of his life. But the fact is that he and his colleagues had hitched their political fortunes to the violence and intolerance that was the Ramjanmabhoomi movement. And today, they have to accept political responsibility for the consequences of that movement, even if the Indian judicial system eventually proves incapable of assigning criminal liability. Second, the manner in which the report names and assigns guilt is likely to accentuate the already acute internal fissures within the party. Indeed, Liberhan may become an ‘internal brahmastra’ for Mr. Advani regardless of the role the report says he played in the demolition. Worse, by bringing Ayodhya back into the news, the report will also encourage those within the Sangh parivar who feel the Ram temple issue should remain at the core of their political agenda. Instead of jettisoning the Hindutva agenda, a remedy that some inside the party now say the 2009 election results indicate, the BJP might then find itself thrust into an even tighter embrace with sectarianism. For the Congress, the party is likely to want to use the report’s recommendations to weaken the BJP and its leadership politically without allowing them to claim the mantle of martyrdom. But after 17 years, those citizens who still feel aggrieved at the criminal destruction of the mosque are also entitled to expect that justice will be done and that all politicians involved in the crime are prosecuted to the full extent of the law. However, the track record of the Congress does not encourage optimism. Most of the recommendations of the Srikrishna Commission of Inquiry into the 1992-93 Bombay riots, for example, remain unimplemented a decade after that report was submitted. And the more fundamental reforms that are needed to protect the citizenry from official acts of omission and commission during riots are not even on the Manmohan Singh government’s radar screen. Well, I feel that the report will reveal "too little, too late". Even if there are startling revelations, they might fade away from public memory well before 2014. Irrespective of what the report reveals, BJP will continue to be associated with this horrific act. What actually bothers me is that the Congress party might go easy on this topic too. Sometimes it is difficult for me to figure out which is the bigger crime - action or inaction? Making too much noise about nothing. See the picture of those morons demolishing the structure. Does the structure look like a place that people actively go to pray, or, does it look like a place of archeological/historical importance. It is only used and kept alive by people for political reasons and for their intellectural pleasures!